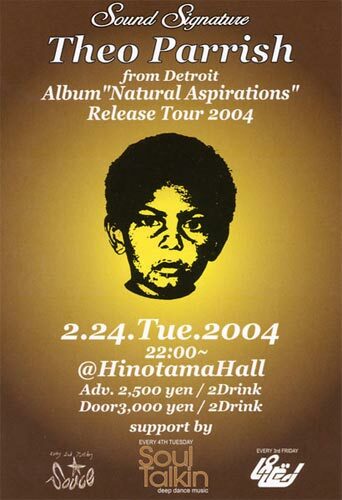 DJ Theo Parrish (Sound Signature / Detroit) will be performing at a very special party on Okinawa as part of his “Natural Aspirations” album release tour of Japan. He will perform at Hinotama Hall in Naha City along with local DJ Naogee (RPZN) on Tuesday, February 24. The party kicks off at 10 p.m. and admission is ¥3,000 with two drinks included. Theo Parrish began DJing and producing tracks in 1986 at the age of thirteen. His interest in music was taken to a new level through his study of sculpture at the Kansas City Art Institute. In 1994, he received a Bachelor of Fine Arts degree from KCAI with a concentration in Sound Sculpture—the orchestration of live instruments, looped recordings, the human voice, and other sound generating devices. Later that year, he moved to Michigan and became heavily involved in Detroit’s underground music scene. Through music production and performances in various venues in Detroit and around the world, Theo Parrish has gained the attention and respect of DJs, producers, listeners, and dancers worldwide. For more information on Theo Parrish, check out www.soundsignature.info. For more information on the party, check out www.unit-dj.com. For driving directions to Hinotama Hall, check out www.gsv2.com or www.hinotamahall.com.